At the end of the Second World War there were many Australian war brides waiting to be reunited with their new British husbands. JoJo Moyes’s newest book, The Ship of Brides, chronicles the fictionalized journey. Based on the HMS Victoria’s 1946 passage from Sydney, Australia to Plymouth, England, the 650 female passengers, expecting transport via more luxurious accommodations, find themselves aboard a naval aircraft carrier, complete with planes, arms, and naval officers, heading towards their new life. The four central characters of the story could not be more different: Jean, a teenager; Avice, a socialite; Frances, a former war nurse; and Margaret, a pregnant farm girl. This foursome, assigned to the same berth, is suddenly thrust together in intimate living quarters and faces the long, six-week voyage to their new lives. Add all-male officers and ship crew to the mix, along with a small group of WSO (Women’s Ship Officers) sent to chaperone the War Brides, and you have an interesting setting to explore the trials and tribulations faced by the temporary residents aboard the HMS Victoria. As with all groups of strangers, each individual brings his or her past, gradually revealed as their time together elapses. Excerpts from newspaper articles, journal entries, ship’s logs, and other documents provide historical grounding for this fictionalized account of a true event. 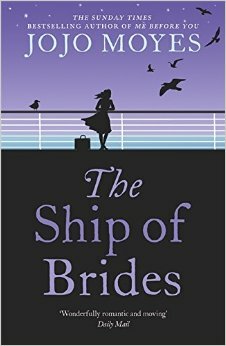 I recommend The Ship of Brides as a book group selection. The story provides a glimpse into the war brides’ anticipatory journey, filled with the hopes, dreams, and fears in a world yet unknown to them.